The SNCT Teachers’ Side rejected the pay offer made by the employers (COSLA) on the 18 September. At the meeting of the SNCT Extended Joint Chairs (EIS, SSTA, COSLA and Scottish Government) the Government officials asked if there was the possibility of further negotiations. A range of issues were raised by the union side and another meeting was arranged for 4 October 2018. At the meeting on 4 October Government Officials stated that the offer was a ‘fair and generous’ pay offer and there was to be no further offer or any grounds for further negotiation. COSLA confirmed that it was not prepared to find additional funds to help further negotiations. It was quite clear that two/thirds of those at the negotiation table had no intention of further negotiation to address the restoration of teacher pay levels. The union side was extremely disappointed (to put it mildly) with this development especially as the offer had been formally rejected on 18 September. The unions had regarded the offer as being “derisory” in terms of the 3% offer across the board and “divisive” in relation to proposing changes to the main-grade scale whilst leaving promoted scales untouched. This was compounded by the fact that additional money (above the offer to teachers) had been found by the Government for funding both the Police and National Health Service professionals. Together with COSLA finding an additional £10m, from its own resources, to assist their pay offer to other Local Authority Staff only added insult to the disappointment. The offer was for 3% across all SNCT posts except for those earning £80,000 or above, whose increase would be limited to £1,600 from April 2018. In addition to the 3% pay increase COSLA also supported a Scottish Government proposal to amend the Main Grade Salary Scale by reducing the number of points from 6 to 5 with a higher starting and finishing point. The amendments to the unpromoted teachers’ pay scale would have seen most points on the scale receiving an additional 2% as from August 2018 (a retention measure). In addition, those teachers who would be moving from Point 0 to Point 1 would receive approximately a 10% pay increase (a recruitment measure for approximately 3,000 teachers). It was reaffirmed to COSLA and Government officials that the 3% offer doesn’t come close to matching the ambition of the SNCT 10% claim for all members at all grades. The Teachers’ side were clear, also, that changes to only the main grade scale would be divisive. This is effectively a differentiated offer pay and this was not acceptable. As the final pay offer has been made SSTA will consult the membership on its views on the offer. The SSTA Salaries Committee has already unanimously rejected the offer, but will be considering the response from the Government and determine the terms of the consultative ballot of its members. The consultative ballot will be conducted when all schools have returned following the October break (more details to follow). SSTA will be circulating more detailed information on the pay offer and the implications to ensure members are fully informed before the consultative ballot. SSTA School Representatives are encouraged to hold school meetings and discuss the pay offer. It is therefore essential that members details are updated and accurate to respond to the pay offer and the possibility of a formal ballot for industrial action. Members can update their details by completing a form on the SSTA website at www.ssta.org.uk/updatedetails. 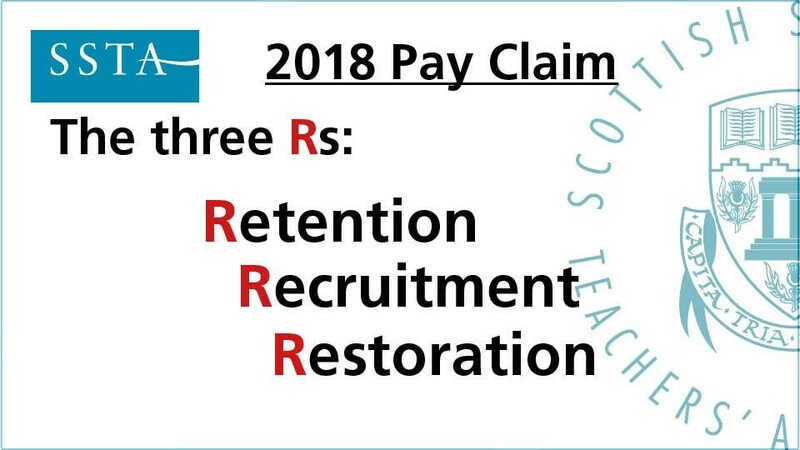 The SSTA has been working closely with the EIS throughout the pay negotiations and has received an invitation for SSTA to support the pay demonstration in Glasgow. The SSTA National Executive wishes to encourage members to support the rally that meets in Kelvingrove Park, on Saturday 27 October at 11.00am (more details to follow).